Water is a limited resource. In Australia, our cities rely on water from diverse sources: Sydney, Melbourne, Brisbane and Canberra rely on surface water catchments and reservoirs; Perth uses surface and groundwater reservoirs; Adelaide is dependent on the Murray River. Growing urban populations and the potential impacts of climate change have driven the need for our governments to ensure water distribution is managed efficiently and to preserve our resource in the long term. The cost for developing the necessary infrastructure and managing the water distribution has pushed water prices upwards over recent years – and prices are considered to only go higher. The National Water Initiative (NWI) pricing principles guides the pricing of water in Australia. The principles were developed jointly by the Australian Government and state and territory governments to assist states implement water pricing in a consistent way. Bulk water prices are then set by the State Governments and water is then distributed and billed in each region by either the local council or water authority. a variable water use charge – calculated on the actual amount of water used. 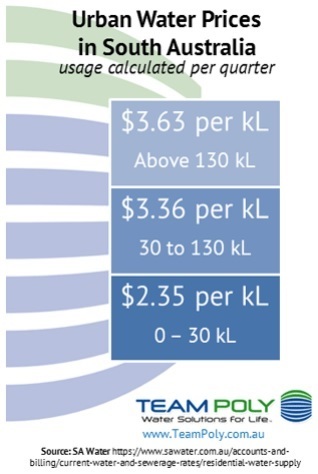 Water use is priced per kilolitre (1,000 litres). To encourage more efficient water usage, some states use “tiered pricing” for water use – meaning the more water you use, the higher the rates your water will be charged at. e.g. South Australia water usage charges as at January 2016. While many states vary water prices depending on the location of the property (city or a rural area), other states, such as South Australia and Northern Territory, apply the same water usage rates to all residents. From mid-2017, Tasmanian residents will also pay the same rate for their water usage no matter the region. 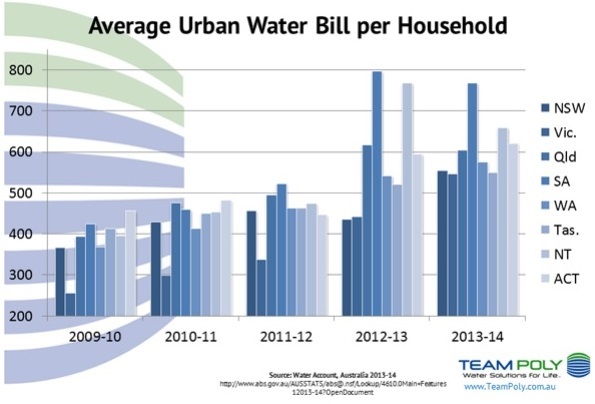 According to the Australian Bureau of Statistics (ABS) Water Account, Australia, 2013-14: Main Findings, South Australian households pay the highest price for urban distributed water (once you account for the service fee costs), followed by Tasmanian households, Victorian households and then Queensland. Water prices are almost certain to continue rise so installing rainwater tanks could help protect you from these further price increases. For more information, see our article: Save with Rainwater Tanks and Beat Future Water Price Hikes.